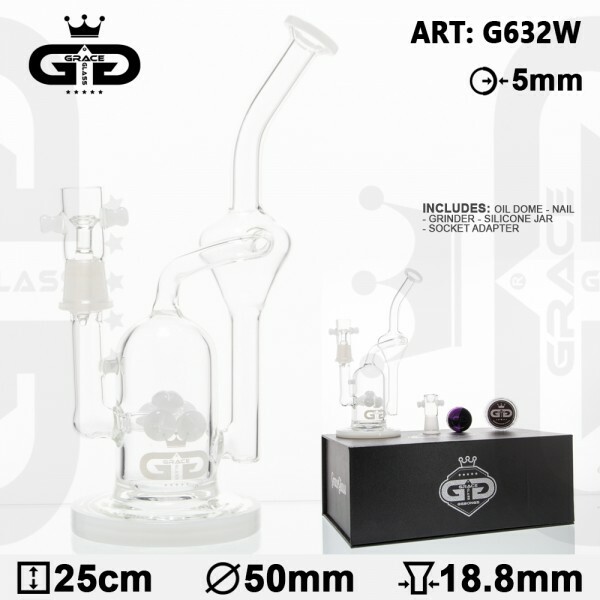 Grace Glass is proud to introduce you a new magnificent design intended for both oil and herb lovers! Made of a high quality borosilicate glass, Ball Recycler Bong comes equipped with an adjoining tube, used for recycling your oil. The tube ends up in a thick mouthpiece through a bending neck that offers you a comfortable grip. An inside dome percolator will extra filter your smoke by breaking it up into smaller particles. The white Grace Glass logo features at the front of the tube. The whole set-up is delivered inside a box, including a 2 point oil dome, a nail, a grinder, a silicone jar, screens, and a socket adapter.